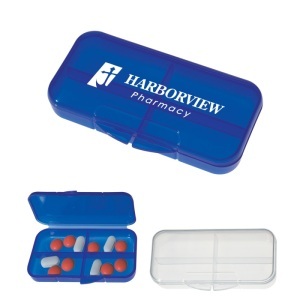 Custom Printed Pill Boxes in many shapes and styles: Oval, Rectangle and Round. 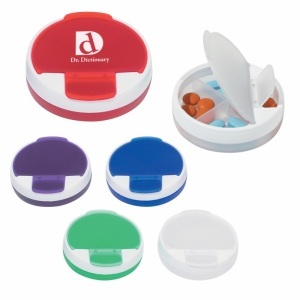 Keep vitamins and medication organized in this oval pill container. 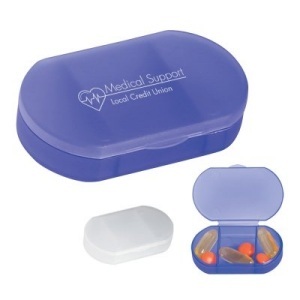 It has 3 separate compartments to keep pills separated and a large imprint area for your custom printed message. Meets FDA Requirements. Set Up Charge: $50.00 on new orders, $25.00 on re-orders. This box has 4 separate compartments. Meets FDA Requirements. Set Up Charge: $50.00 per color on new orders, $25.00 per color on re-orders. Round Pill Box with 4 separate compartments has rotating top with large and small snap lids. Meets FDA Requirements. Discontinued – contact us for availability. These ink colors are our standard colors at no additional cost. If a PMS Color match is requested add $50.00 per PMS color. PMS Color Match cannot be guaranteed on dark colored items.